Life is Such a Crazy Beautiful Thing! So much has been happening lately and so much is about to happen! 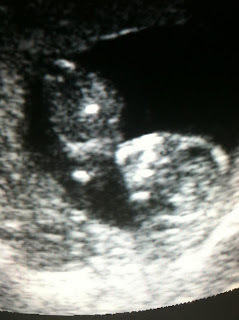 On July 9th I had my LAST ultrasound of Camden's baby sister, Ryleigh, until my 32 week ultrasound. You know what that means? GOOD NEWS! My blood work came back good and the ultrasound did NOT show any abnormalities! So, no more extra appointments or ultrasounds! My baby girl is just going to be on the small side, with her arms measuring in the 15th percentile and her legs in the 25th percentile. Her measurements are completely normal, just on the small side of normal. I am so blessed to be able to say that I have 2 healthy children! Before my ultrasound, I had a video conference with a genetic counselor to talk about Camden. She recommended getting Camden tested when he is around 5 (That age is what she recommended without a reason. I am sure we could get testing done sooner, but I don't feel that finding the answer is necessary until Camden is old enough to ask questions and let him make that decision for himself. So we might wait even longer than that until or even if he ever wants it done.) to see if they can find a genetic reason for his limbs not developing. The ONLY way it could be genetic, is if me and Camden's Dad BOTH carry the gene for his limbs not developing. If only one of us carried the gene, then it would be the same as neither of us carrying it. If we both carry the gene, our siblings could also carry it, but it would not affect their children unless they had a child with someone who also carried the same gene. What are the chances of that though? We would have to have a very lucky family if one of our siblings drew the same straw as Frazier and I! Hope that doesn't confuse you too bad. It's very complicated. Camden has FINALLY started occupational therapy! He had his evaluation 2 weeks ago and his first real appointment last Wednesday. We discussed that it would be good for him to do sensory projects and about getting him a sensory table made. I couldn't wait for a table to be made, so I started our own sensory projects using his walker! So far we have done oatmeal and Froot Loops, peanut butter and apples, and yogurt and Cheerios! Here is a short video of Camden going to town on some peanut butter! He made such a mess, but it filled my heart to see him so happy! 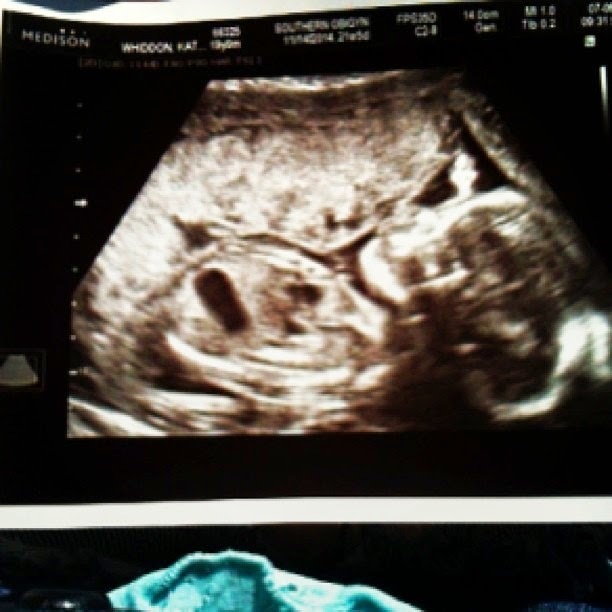 I am 6 months pregnant with baby sister, Ryleigh, now! She is starting to be a very active baby girl! This pregnancy is just so much different than my pregnancy with Camden. Ryleighs movements feel so strange compared to what I felt with Camden! According to my pregnancy app, she weighs about 1.5 pounds and is about 13 inches long! That is half an inch longer than Camden was when he was born! She is also starting to produce "surfacant" which means her little lungs are getting stronger and stronger everyday and if she were born now, she would be very likely to survive! Isn't that such a huge milestone! I am so blessed to be this far in my pregnancy and not having any complications so far! It really is such a relief! At my last appointment with my OB we talked about scheduling my csection at my 32 week appointment (thats only 7 weeks away!) and I am really hoping he will let me go to my due date as long as I don't go into labor and everything is fine with Ryleigh. I am so afraid of her having to be put in the NICU for breathing complications like her big brother had, and he was born only 8 days before his due date! That showed me every day in the belly matters a lot. Camden likes playing with my belly button. 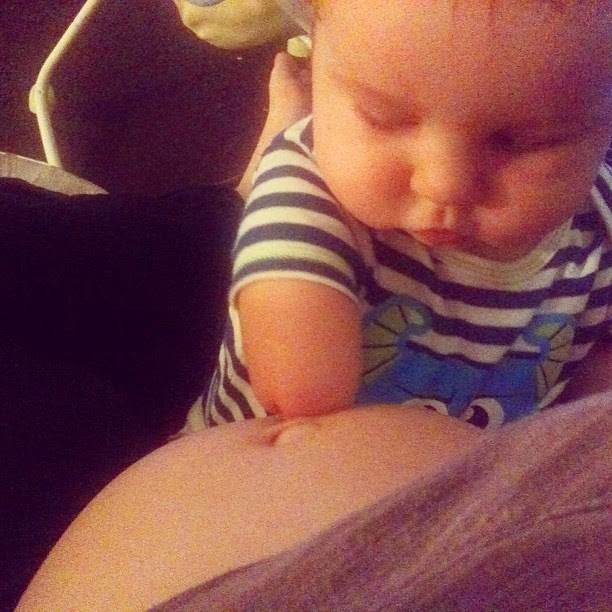 Baby sister doesn't like when Camden is on my belly though, she's always pushing him to get off of her! Yesterday, Camden got something VERY special in the mail, and just in time for him turning 10 months old today! There is a company, Healing Helpers, that makes stuffed animals to help children going through all kinds of medical issues! 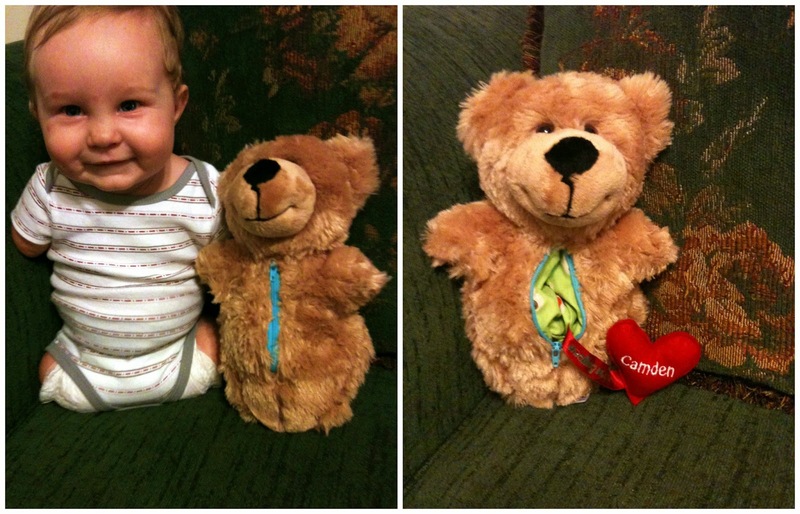 I messaged Healing Helpers a couple weeks ago about making Camden a stuffed animal that is just like him! A little while later I decided I wanted to get it for Camden's birthday (which obviously he got it a little sooner) and Healing Helpers messaged me around that same time letting me know that someone had paid for Camden's Healing Helper and that they needed an address to send it to! That was such a blessing and I want to thank the person who paid for Camden's bear one more time! When we got it in the mail I saw "Healing Helpers" on the box and I got so excited!! Me and Camden took out this beautiful soft bear that was made EXACTLY like him! Right down to the length of the arms! 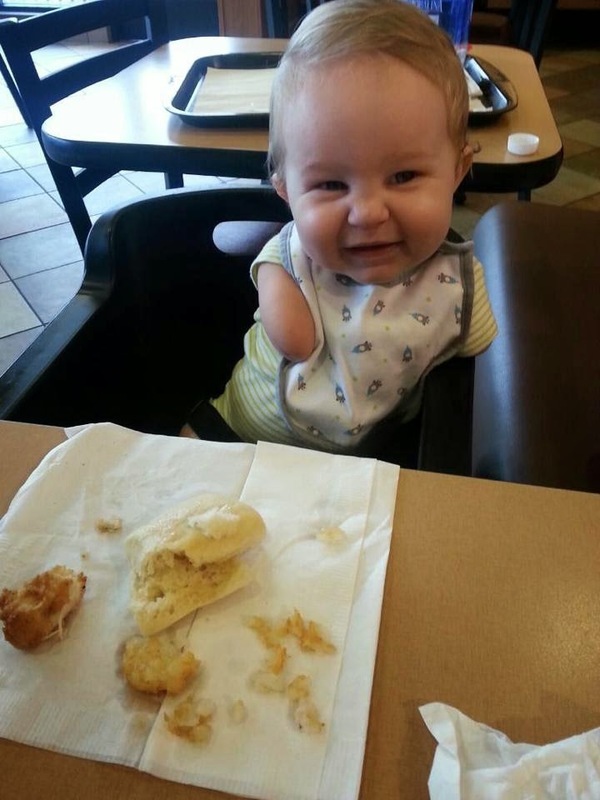 Camden's left arm is half the length of his right arm, and that is exactly how his bear's arms were. Inside the zipper was a sweet little heart with Camden's name on it. WE LOVE HEALING HELPERS and we love the lady who is using her talent to make these beautiful stuffed animals for children who need a buddy to go through life with! To check out Healing Helpers and/or to see about getting a Healing Helper for your little one, click here. Don't forget to 'like' their page and show some love. Today Camden turned 10 months old! Time is going by so fast and I feel like I don't have enough of it! Ryleigh's baby shower is in ONE MONTH. I just cannot wait to celebrate my baby girl and to share the pictures with all of you! Camden's FIRST birthday is in TWO MONTHS. His party is going to be a pirate theme! It's going to be so much fun and I hope I can capture it all for you to see! In THREE MONTHS will be when baby sister is born! Makes me so nervous that I don't have that much time! We are going to be so busy this whole time and its going to blow by. Thank you all for your love and support! I feel so blessed that Camden has so many people who care to follow his beautiful journey and when baby sister arrives you will all get double the fun!! I am so happy that God answers prayer, because I know without your prayers we would not have the wonderful and beautiful life that we have today! God is so good!